Olympic Hymn. Photo & text: David Secombe. 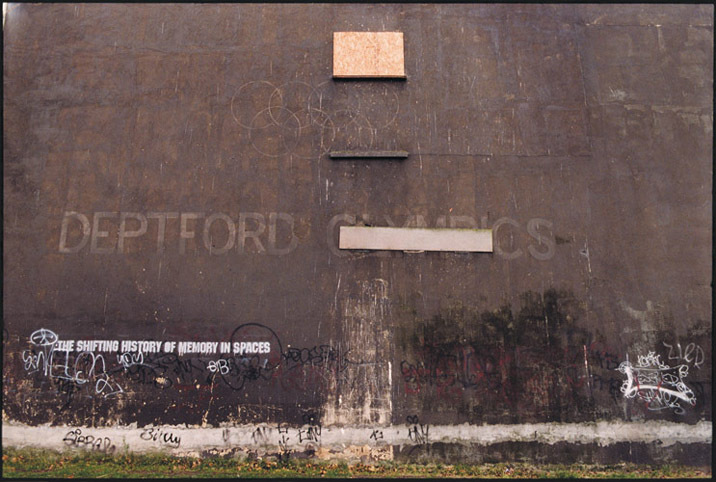 Posted: July 27, 2012 | Author: thelondoncolumn | Filed under: Sport | Tags: Airstrip One, Barrie Keefe, Deptford Olympics, Harold Shand, London 2012, London Olympics, Lord Coe, Millennium Dome, Newspeak, prolefeed, Team GB, The Long Good Friday, The Shifting History of memory in Spaces, Tony Blair |Comments Off on Olympic Hymn. Photo & text: David Secombe. Deptford. © David Secombe 1999. HAROLD: I’m not a politician. I’m a businessman. And I’m also a Londoner – and today is a day of great historical significance for London. Our country is not an island any more – we’re a leading European state. And I believe that this is the decade in which London will become Europe’s capital. That, ladies and gentlemen, is why you are here today. Of course, £9bn is in one sense a lot of money but, in another sense, you’re regenerating an entire part of the country, creating thousands of jobs and there’s massive amounts of investment coming in. [Asked whether the same figure could simply have been spent on regeneration without the Games:] It’s not quite the same. You’ve got the Olympics! When people start making arguments like this I just have to say ‘Come on guys, this is the biggest sporting event in the world and we’re hosting it.’ A bit of pride there, I think. Anyone following The London Column recently will have detected a certain creeping cynicism amongst our contributors towards the looming Olympic bunfight. The naysayers in our ranks all have specific objections, but the consensus amongst our group of refuseniks is that the construction of the main Olympic site has obliterated a sylvan wilderness that was a genuine resource for locals; that the corporate stranglehold over any kind of local expression of dissent (or even unauthorised expressions of enthusiasm) relating to the sponsors’ involvement in the Games is anti-democratic and an affront to free speech; and that the militarised nature of its policing serves to emphasise that the host country has acquired a dodgy international reputation for itself. Orwell’s 1984 looms over the festival of sporting prowess and universal brotherhood: the Airstrip One Olympics. For what it’s worth (and given that this is a site with only a few thousand readers, it may not be worth very much), we might as well ask a big and perhaps fatuous question: why does London need the Olympic Games? The Olympic body has long been discredited by its willingness to accommodate totalitarian regimes (Berlin, Moscow, Beijing) or to ignore local tragedy in the interests of ‘higher sport’ (Mexico City, Munich); and the athletic ideal the Games ostensibly represent has for years been tarnished by the self-doping tactics of class-leading athletes desperate to stay at the top of their game. What’s left is sheer spectacle underwritten by a cold business imperative: so the drive to compete, to achieve upon the world stage is the language of corporations yoked inelegantly to the inarticulate nature of sporting endeavour. Thus the simple and elegant term ‘The British Olympic Team’ is reduced to the ugly signage of ‘Team GB’ – a change they were advised to make to foster corporate sponsorship (it worked). Promoters of the London Games use all the chilling cliches of contemporary corporate language; language which makes Barrie Keefe’s proto-Thatcherite gangster Harold Shand straightforwardly articulate when compared to the likes of Sebastian Coe or Tony Blair. Speaking of Blair, it was he who gave London the Millennium Dome, a prime example of monumental gesture architecture in search of appropriate content: given the abject failure of that grand project, it is perhaps understandable that such a vain politician would wish to have another go at self-commemoration (‘If you seek my monument, take the Jubilee line to North Greenwich and Stratford’.) No-one could dismiss the Olympic Games as a non-event: but London is a Roman city, and without getting too psychogeographical about it, it’s worth remembering that Caesar also knew how to put on a good show, especially when times were tough. You can see Richard Strauss conducting his Olympic Hymn for Hitler and the crowds at the 1936 Berlin Olympics here.